Although periodontal disease is an infectious disease of the gingival tissue, changes in the bone are crucial because bone destruction eventually leads to tooth loss. Different types of bone deformities can result from periodontal disease. They can be easily detected on radiograph, but careful probing and surgical exposure of the areas are needed to confirm the exact dimensions. It is the most common bone loss pattern seen in periodontitis. The bone level is reduced, but the bony margins remain perpendicular to the tooth surface. The facial and lingual bony plates, and the interdental septa are affected but not necessarily to an equal degree around the same tooth. They occur in an oblique direction leaving a trough along side the root. 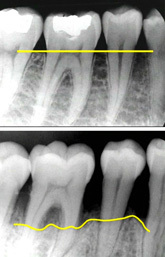 The base of the defect is located apical to the surrounding bone. They are classified on the basis of the no. of osseous walls absent. They are called as 1,2 3 walled defects. The 3 walled angular defect is also called a hemiseptal defect which indicates the presence of 1 bony wall. Such defects ensure poor prognosis. These are concavities in the crest of the interdental bone confined within the facial and lingual walls. Commonly seen in mandibular posterior segments. These are bony enlargments caused by exostoses, adaptation ta funtion by tressing bone formation, found more frequently in the maxilla. This leads to reversing the bony architecture. Commonly seen in the maxilla. These are plateau like bony margins caused by resorption of thickend bony plates. This refers to the invasion of the bifurcation and trifurcation of multi rooted teeth by periodontal disease. Furcation involvements can be classified as GradesI,II,III,IV depending on the amount of tissue destruction.